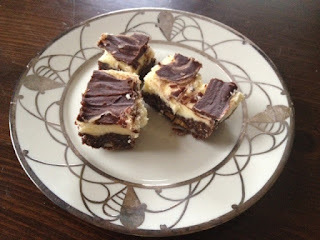 We are visiting Claire and Elie in Boston and Claire made these delicious Nanaimo bars. She got the recipe from Nanaimo, B.C. from a tourist magazine on a recent trip out west. They stopped in the town on the way back from Eli's family cottage in Hornby. As she says, "You Ontarians probably don't even know that Nanaimo is a real place!!" I did know it existed but I hadn't made the association with this dessert. The tourist magazine said the bar originated in Ladysmith, a town just south of Nanaimo. The recipe was submitted to a cookbook sold in the early 1950's as a fundraiser. These bars are not baked. They are a great treat!! Melt first 3 ingredients in top of double boiler. Add beaten egg and stir until thickened. Remove pan from heat. Stir in crumbs, coconut and almonds. Press firmly into an ungreased 8-inch by 8-inch pan. Cream butter, cream, custard powder and icing sugar together well. Beat until light, spread over bottom layer. Melt chocolate and butter together over low heat. Cool slightly. When cool but still liquid, pour mixture over second layer and refrigerate to chill. Cut into squares and serve.